This No-Bake Peppermint Mocha Cheesecake is rich, creamy, and so flavorful! 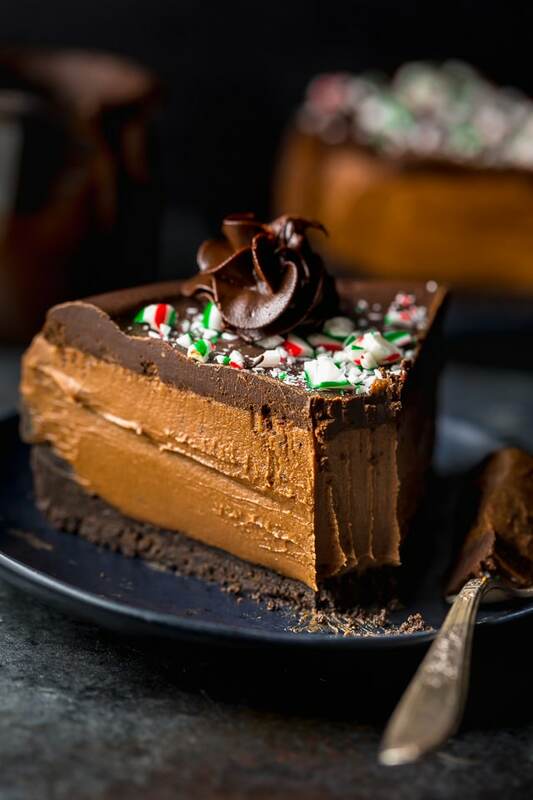 Topped with chocolate ganache and crushed candy canes, this chocolate peppermint cheesecake is seriously festive and perfect for holiday celebrations. The only thing I love more than chocolate is the combination of rich chocolate and perky peppermint! Seriously… I’m such a fan girl for this flavor combo. Especially around the holidays! So when my lovely friends at Lindt Chocolate sent me their LINDOR Peppermint Cookie Milk Chocolate Truffles, I literally couldn’t wait to try them. And they did not disappoint! Each delicate milk chocolate shell is subtly infused with crunchy COOKIE PIECES!!! And the irresistibly smooth truffle filling is perfectly flavored with peppermint! If you adore chocolate and peppermint, I’m confident you will LOVE these truffles. My favorite way to enjoy them is with a cup of coffee! Which was the inspiration for today’s brand new recipe: No-Bake Peppermint Mocha Cheesecake! It’s a total showstopper and perfect for special celebrations like Christmas! So let’s dig in, shall we?! 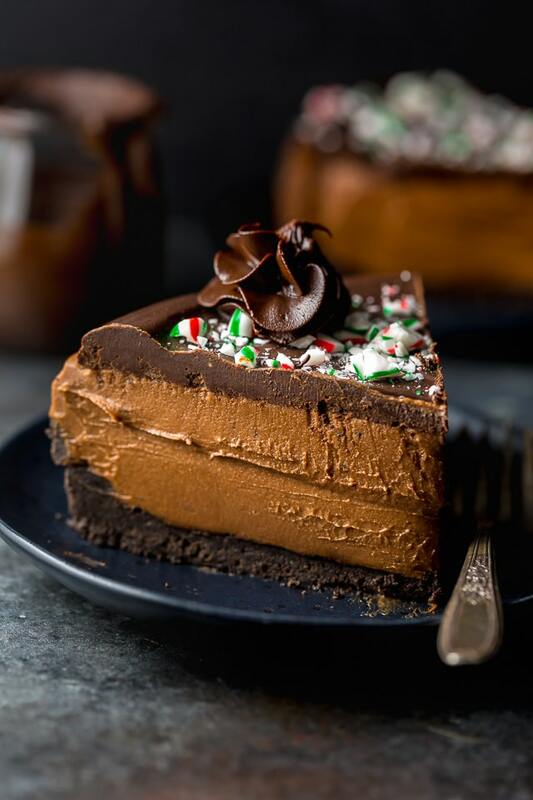 Room temperature ingredients are crucial when it comes to making any cheesecake – including this peppermint mocha cheesecake! So be sure you bring your cream cheese and heavy cream to room temperature before you begin assembling the batter. Because cold ingredients do not bind. You’ll melt the unwrapped truffles and chopped chocolate before adding it to the cheesecake batter. I suggest doing this step first so that the mixture can slightly cool while you assemble the filling. To make the chocolate cookie crust you will need three ingredients: melted butter, chocolate sandwich cookies, and espresso powder. That’s it! You do not need to remove the cream from the center of the cookies. Simply place them in a blender or food processor and pulverize them into small crumbs. The mocha flavor in this recipe comes from the addition of espresso powder, which you should be able to find at most grocery stores, and can definitely find online. Espresso powder is intensely dark and concentrated instant coffee that quickly dissolves in liquid. 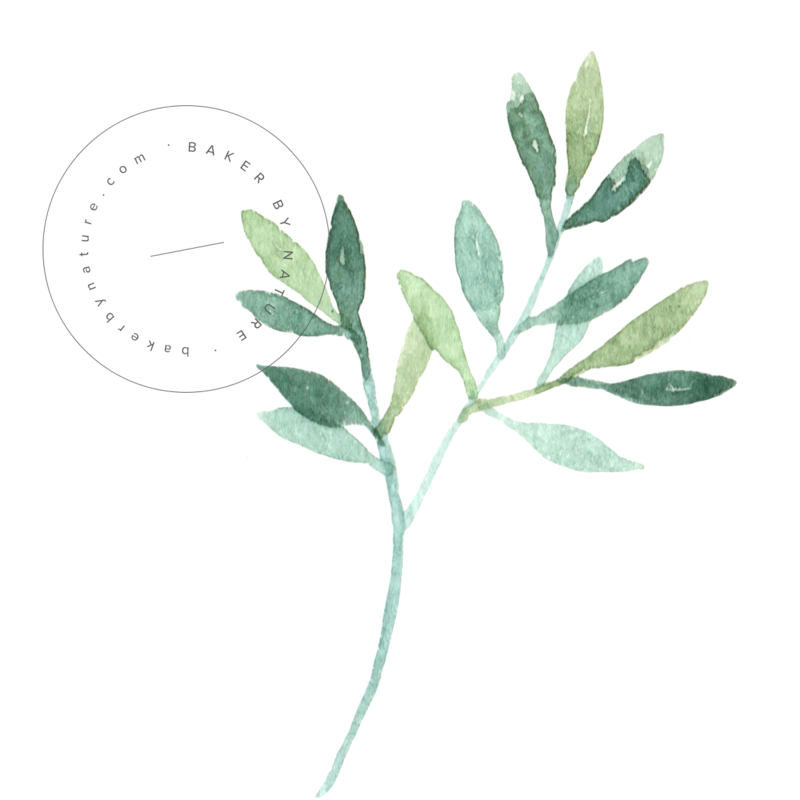 It is not just finely ground coffee beans. 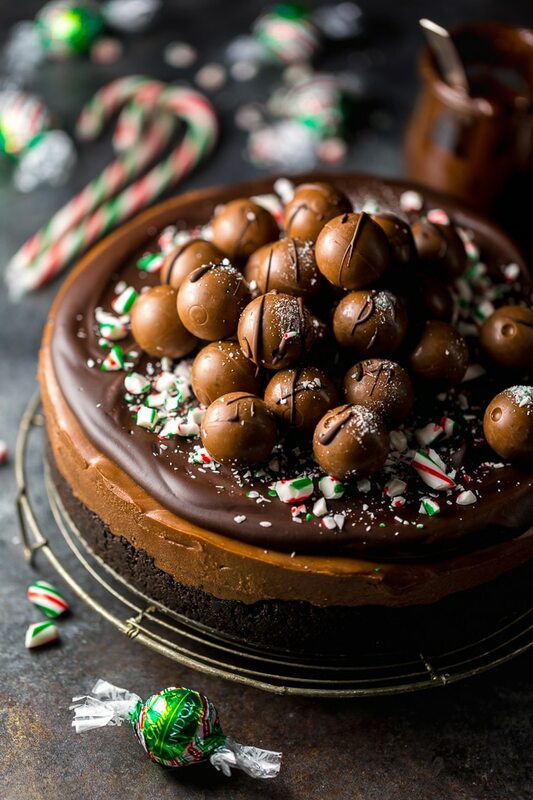 If you cannot find espresso powder, or would prefer this to be a peppermint chocolate cheesecake without a mocha kick, simply omit this ingredient from the recipe. Because the chocolate cookie crust is not baked, you’ll want to press it into the bottom of the pan very firmly! This will help the crust hold together nicely when you slice and serve the cheesecake. You can make the cheesecake batter in a food processor, high-power blender, or stand mixer. Another option is to make it in a large bowl using a handheld electric mixer. But I always use my blender because that’s the most convenient for me. Just be sure you really blend the cream cheese on its own before adding the other ingredients. This recipe does requires a springform pan, so if you don’t already own one and need a good place to start, feel free to click here and check out the one I’ve been using for years. Finally, you’ll want to be sure you chill the cheesecake in the refrigerator for at least 6 hours before slicing and serving. Otherwise it’ll be too soft to slice! I LOVE dolling up a recipe so that it looks just as incredible as it tastes. And doing that with this cheesecake is quite simple! Just buy an extra bag (or two!) 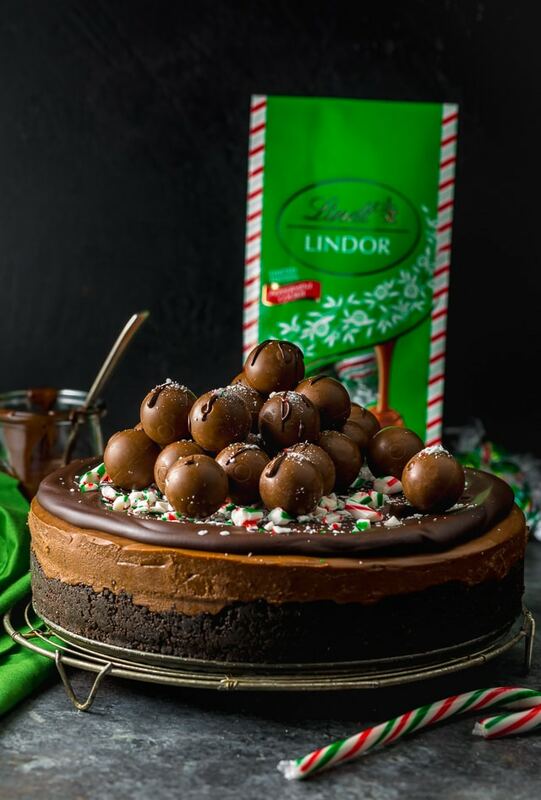 or the LINDOR Peppermint Cookie Milk Chocolate Truffles and pile them on top of the chocolate ganache. It instantly gives dimension to the cheesecake and adds a WOW factor that will stun your guests. 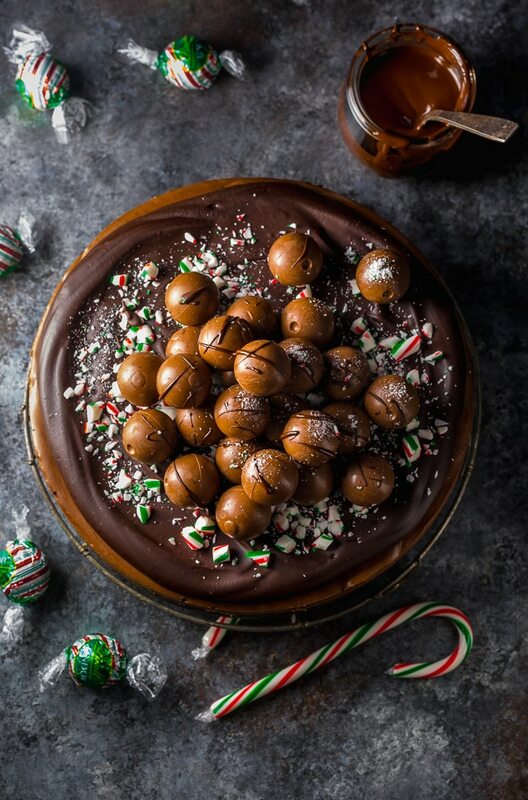 And if you want to take it a step further, you can drizzle a little melted chocolate on top of the truffles, and then sprinkle the wet chocolate with crushed candy canes. I plan on doing this for our Christmas party! 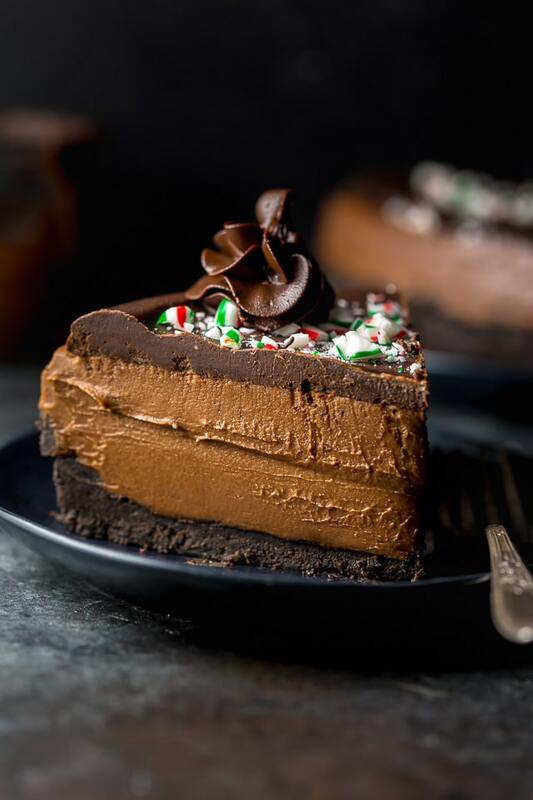 A simply swirl of peppermint mocha ganache is also a beautiful way to serve this chocolate cheesecake, especially if you’re serving individual slices. 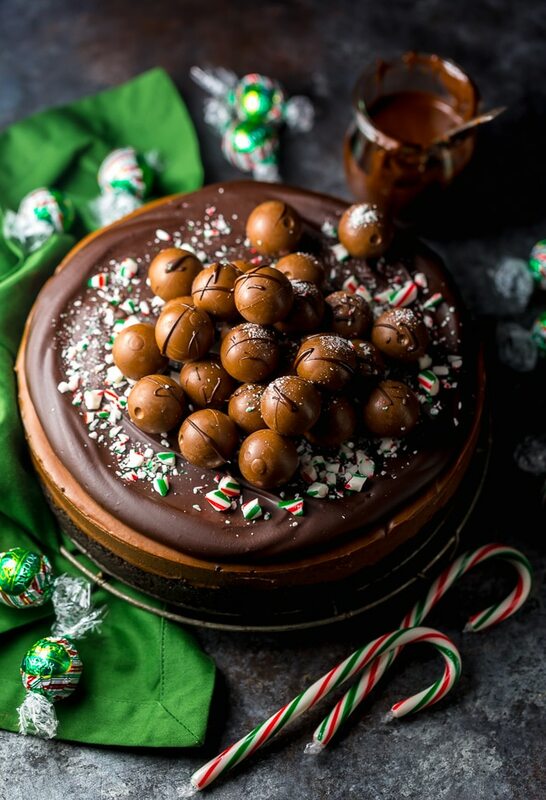 There are two easy ways to freeze this peppermint chocolate cheesecake! The first is to allow the cheesecake to chill in the fridge for at least 6 hours, then wrap the whole thing in a few layers of saran wrap (or aluminum foil) and freeze. A second option is to chill for the previously mentioned time, then slice the cheesecake into pieces, wrap each piece in a few layers of saran or aluminum foil, and freeze. This cheesecake will keep in the freezer for up to two months! Simply thaw overnight in the fridge before serving. 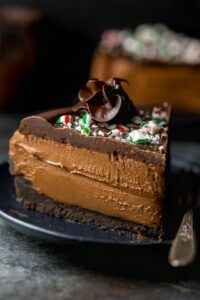 I suggest freezing this peppermint chocolate cheesecake without the peppermint mocha ganache, and then adding that before serving. But it can be frozen with the ganache if you’re really in a time crunch. Just be aware if you freeze with the ganache, it won’t be as shiny when you serve it. But it’ll still taste delicious! 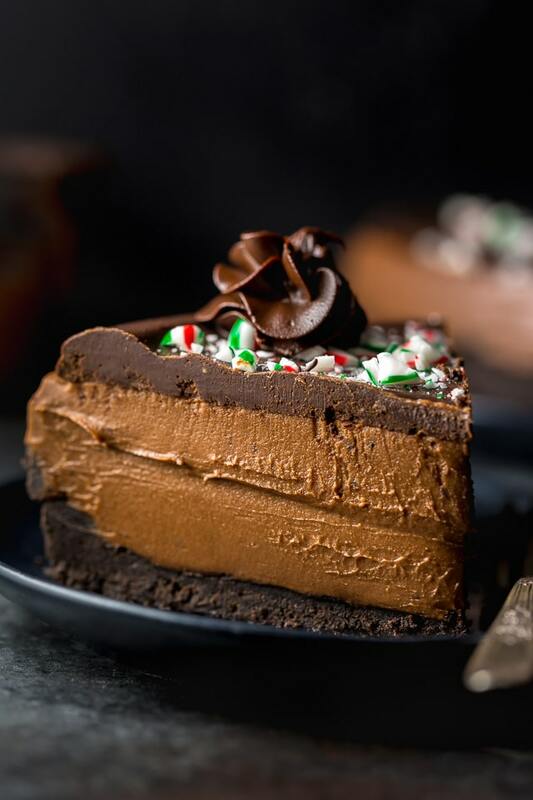 Make your holiday season extra sweet with this STUNNING Peppermint Mocha Cheesecake! 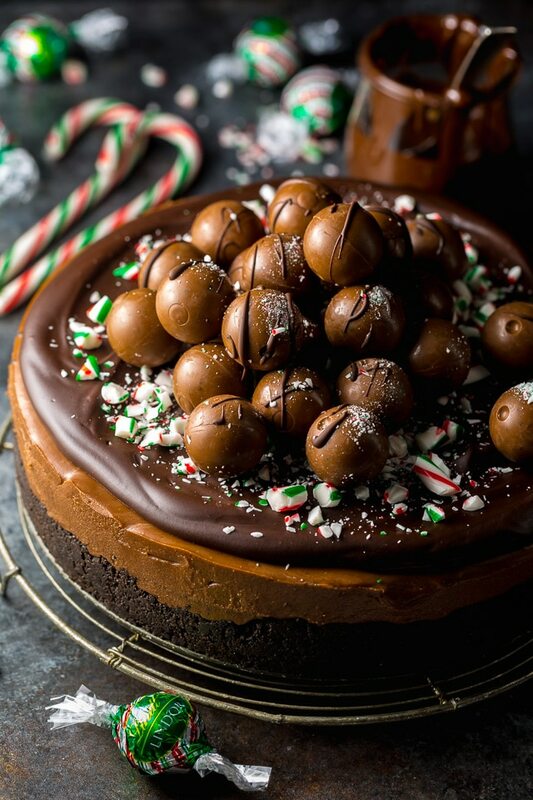 If you try this recipe for No-Bake Peppermint Mocha Cheesecake, let me know! Leave a comment below and don’t forget to snap a pic and tag it #bakerbynature and #Lindtlove on instagram! Seeing your kitchen creations makes our day. Today’s post is sponsored by my chocolate family: Lindt! Their high-quality, super delicious chocolate makes life – and my recipes – extra delicious! 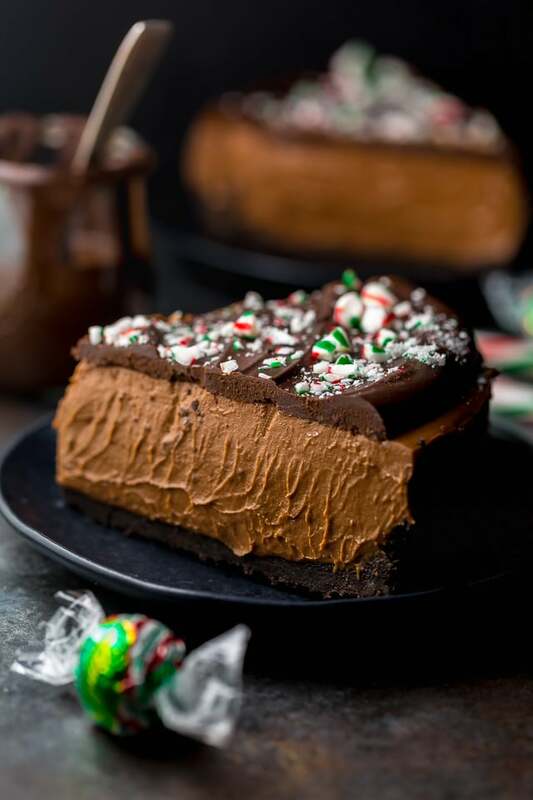 This No-Bake Peppermint Mocha Cheesecake is rich, creamy, and so decadent! Lightly grease the bottom and sides of a 9-inch springform pan. In a large bowl combine the Oreo cookie crumbs, melted butter, and espresso powder; mix well to combine. Press the crust into the prepared pan, pressing it firmly down in the middle and slightly up the sides. Place crust in the freezer while you prepare the filling. Fill a medium pot one-third full with water and bring it to a low simmer over medium heat. Place a heatproof bowl that will fit on top of the pan snugly, but will not touch the simmering water, on top of the pan. Reduce the heat to low and add the unwrapped peppermint cookie truffles and chopped chocolate into the bowl over the pot. Heat until the chocolate is completely melted, stirring occasionally with a silicon spatula. Remove the pot from the heat, leaving the bowl of chocolate over the hot water. Stir in the espresso powder. Set aside until needed. In the bowl of a food processor (or high-powered blender), pulse the cream cheese until completely smooth, scraping down the sides of the bowl as needed, about 2 minutes. Add in both sugars and cocoa powder and beat smooth. Add in the peppermint extract and heavy cream and mix until just combined, about 20 seconds. Fold in the chocolate until evenly combined. The mixture will be very thick at this point. Remove the bowl from the food processor and, using a rubber spatula, stir the filling several times to ensure it’s evenly blended. Remove the crust form the freezer. Scrape the filling over the crust and smooth the top. Transfer the cheesecake to the refrigerator to chill for at least 6 hours. Add chopped chocolate to a medium bowl; set aside. In a small saucepan over medium-heat, bring the cream to a low simmer. Pour half of the cream on top of the chocolate pieces and set aside for 2 minutes. With a whisk, begin to incorporate the melted chocolate into the cream. Slowly add the remaining cream and continue carefully whisking until smooth and glossy. Add in the butter and use a spatula to stir until the butter is completely melted. Fold in the espresso powder. The mixture will be dark and glossy. Spread the ganache over the chilled cheesecake. Sprinkle with crushed candy canes and set aside until ganache is set, about 1 hour. To serve, slice the cheesecake with a thin-bladed sharp knife, wiping the knife clean between each cut. Store, loosely covered, in the refrigerator, for up to 4 days. The photos of the cheesecake look so amazing, and I am sure it tastes as good as it looks. If I cannot find the peppermint truffles, can I use peppermint extract? If so, how much? Should i use milk chocolate? Hello! 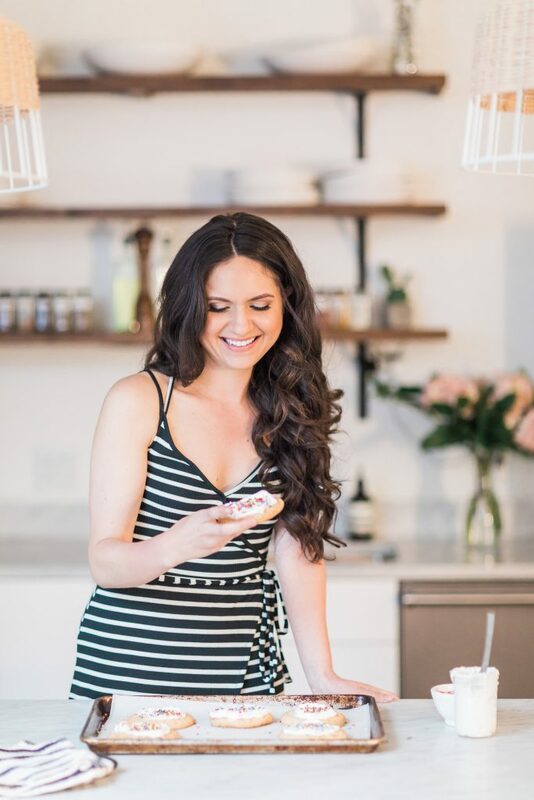 I follow you on Instagram, have pinned several of your recipes, and LOVE your stuff! This recipe in particular looks AMAZINGLY chocolatey which is always a good idea!